My Hair Clinic is a high-end FUE hair transplant clinic. As one of the very few clinics we offer you to have the consultation, extraction, design and follow-up by Dr Hussain himself. With 14 years of experience you have the safety of knowing you are in the best of hands when it comes to getting your hair back. 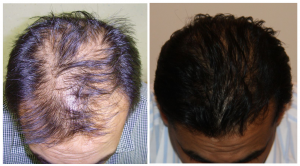 MHC offers surgical and medical hair restoration. One size does not fit all and we tailor each treatment to each patient. Due to age, donor hair availability, hair loss pattern, hair texture and quality we may recommend one patient to have a hair transplant while another patient, with apparently the same hair loss pattern, may be recommended medical hair restoration. We also offer medical hair restoration which may involve one or more of the following options: PRP, finasteride, microneedling, minoxidil, shampoo and treatment of any underlying medical condition. Again, it’s important that each and every treatment is tailored to the individual patient. Dosage, effect and side effects must be monitored to ensure that the treatment protocol for each patient is optimized. Regardless of which treatment is right for you, it’s important that you know that you are in safe hands with My Hair Clinic. With 14 years of experience in the field of hair restoration you can rest assured we take your situation seriously and work to improve your hair. You can opt to have Dr Hussain as your main contact person all through the process: From consultation, extraction, design and follow up. If you wish to have a more reasonable surgery then you can opt to have the procedure by one the surgeons personally trained by or vetted by Dr Hussain to ensure that they meet the required standard. Our focus is on delivering a high quality hair transplant or medical hair restoration without any compromises. Most importantly we want your hair to look natural so that you can boost your self-confidence without having to worry about people noticing your hair being transplanted. The commitment to excellence also means that we are certainly not as fast as many other clinics. Dr Hussain does one surgery per day to devote his time to each patient that is having a surgery. To ensure the results are natural, Dr Hussain uses custom-made slits to design the hair and hairline. Mimicking the natural 3D direction of your own hair we have brought science and nature together to create a hairline that you deserve. A hairline and new hair that will transform you and boost your confidence like nothing else. The best investment you can do in yourself. We have offices in UK, Norway and Pakistan. 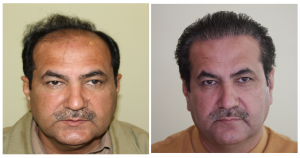 We offer hair transplant surgery at a reasonable price at our hair clinic in Islamabad only a few hours travel from Dubai, Saudi Arabia, Qatar, Karachi, Lahore, Faisalabad, Multan and Peshawar. A high quality hair transplantation clinic could be closer than you think. Follicular Unit Extraction, or FUE, involves removing healthy hair follicles directly from a donor area on the scalp (usually at the back of the head where the hair is plentiful) and implanting them onto the bald or thinning areas. Quite honestly, FUE is not rocket science. However, Picasso is also not rocket science. It’s what you make of the grafts available that counts. It’s vital that the surgeon and the team understand how to store the grafts to prevent them from trauma and low growth. It’s vital that the grafts are used correctly to maximise the coverage and the cosmetic impact. Further, it’s important that the hair transplant looks like your own natural, un-transplanted hair. While hair transplantation is not rocket science it does require a great understanding of hair, hair growth, natural hair patterns, limitations and possibilities with the available number of grafts. It’s also important that the surgeon knows when not to perform a hair transplantation. Although, hair transplantation can be performed on most patients it may not be the best solution for all patients. Dr. Mohammad Mazhar Hussain started MY HAIR CLINIC in 2004, offering high quality FUE hair transplantation at an affordable price. 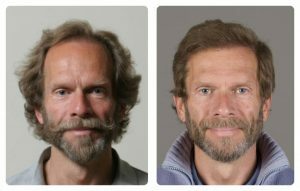 With one clinic each in Nottingham and central Oslo and two clinics in Islamabad a FUE hair transplant at a reasonable price could be closer than you think. He obtained his MD degree in 1994, University of Copenhagen, Denmark and has worked in several European countries. Dr Hussain was an active politician and the first Pakistani to be elected as a member of the Copenhagen County Council, Denmark. Dr. Hussain speaks Danish, English, Norwegian, Punjabi, Urdu and Hindi fluently. Dr. Hussain personally trains or vets all staff to ensure a uniform high standard of hair transplant surgery at all locations of MY HAIR CLINIC. He also trains visiting doctors in FUE hair transplantation. MY HAIR CLINIC is probably the only clinic worldwide where 99% of the patients come travelling from abroad.